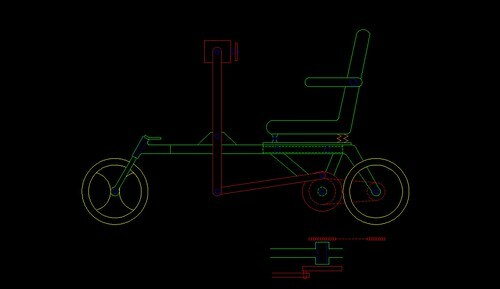 Our team mission is to build a hand-powered tricycle for ages 10 - 16+. This main goal of this device is to inspire physical activity and recreation for a growing child who has no use of their lower extremities. 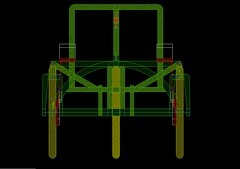 For the fall of 2010, our team has chosen to design a whole new tri-wheeled device. This device is meant to inspire physical activity and recreation for children ages ten and up who have either lost, or never had the use of their lower extremities. The name we have chosen for our device is the Athlon, which is Greek for the verb meaning “to compete.” Because we do not have a specific child in mind for our design, we have decided that one of the initial requirements for the Athlon is that certain sections should be adjustable in length. We believe that this will not only allow the Athlon to be used by a variety of middle-school aged children, but that it will also be capable of simple extension to provide use for the child as they reach adulthood. Our second requirement is that the Athlon should be powered by both pushing and pulling forces generated by the arms. Additional specifications involve safety, lightness of weight, easy transitions for mounting and dismounting, steering, breaking, and gear shifting. We hope to implement a continuously variable transmission for the Athlon; however, the addition of CVT’s would dramatically increase the production cost. Our team is currently considering 3 designs. The first concept uses rotational motion to power the trike. It has two wheels in the front and one wheel in the back. With this design, each of the front wheels is independent of one another. Each has it own braking and acceleration. This design offers a high level of maneuverability. 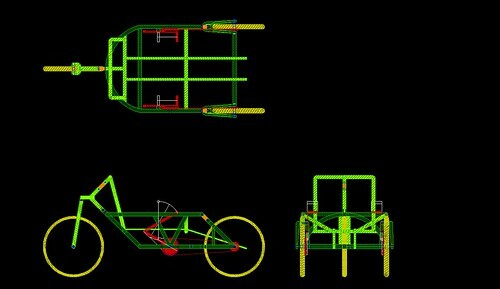 Our 2nd design is a row-action powered trike. It is the only design with one wheel in the front and two wheels in back. The power drive is 2-wheeled, meaning the back two wheels will be locked together, and the steering is left to the front single wheel. Our 3rd deign is the most complex. It encompasses a mix between the last two designs. This design would be row-action like the first, but have its two wheels in the front. Like the 2nd design, each of the front wheels will be independent of one another, giving the driver steering ability in pumping and braking. This last design is expected to be the most unique, but most expensive to manufacture. A reverse trike utilizing the rear swingarms, wheels, and drivetrain from existing mountain bikes. The driver will be able to independently turn or brake either side, allowing for “Zero-degree” turns. Also this design allows the driver to push the handles in a complete circle to power the trike, or to use a ratcheting technique of pushing through part of a circle and pulling back to the original position to push again. Seating, breaking, handles, and gear-shifting has not yet been incorporated into design. Reverse trike design is stable and allows a tight turning radius. Many parts come from bicycles already in production. Capability of having multiple gear ratios. Suspensions from mountain bikes allows navigation through rough terrain. Room for storage behind seat. Rear caster wheel could be unstable at high speeds. Requires two separate drive trains to be serviced and adjusted. Gear ratio would need to be changed simultaneously on both sides to keep trike stable. Longer design may be difficult to maneuver. The tricycle is powered by pushing the handle bar forward and also powered by pulling back the handle bar. So no energy is wasted in the rowing motion of the tricycle. Breaking, handles, and gear-shifting has not yet been incorporated into design. For our previous two designs, we utilized functional base models that have been successfully built and tested. Each of these models has their own set of advantages and disadvantages, but both have been proven in the field. Our third design is meant to distinguish a hybrid concept of hand powered tricycle that implements features from both of the previous designs. Because we have not yet witnessed a completed prototype of similar design, many specifications are yet to be determined. Open front with extendable mechanism can make independent mounting and dismounting from a wheelchair easier. Rowing levers allow direct push and pull power transfer. Independent drives allow a tight turning radius. Mountain bike swing arms are pre-manufactured and afford good suspension and gearing. Kinematic design and frame can support the addition of adjustable seating and levers to accommodate child development and passengers of different sizes. Small enough to fit in the bed of a pick-up truck. Dual drives increase the cost of parts and maintenance labor. Drive linkage places passenger load further from the turn radius center, increasing centripetal force experienced during a turn. Extended length and load placement may cause instability in rear wheel. Breaking failure in one of the front drive wheels at high speeds might cause sudden change in direction and possibly tipping. Meeting with a team of three engineers, the project received some clarification. The biggest change would be the order of importance we ranked our different objectives. We were advised not to focus on adjust-ability. Issues like functionality, efficiency, and safety will be our core focus. The engineer group commented on several specific ideas. One concern was a child's ability to learn to drive on a bike that requires two seperate inputs. Would a child that has never rode a bike before struggle steering? Here our second design stands out in the simplicity of controls. Another concern is an overcomplicated design. We were advised that time and cost constraints should narrow the scope of our project to the points that matter. Again, the second design was chosen as the best choice. With a unanimous decision among the engineering group, Design 2 will now be the focus of our project. Our Analysis focus on the kinematic movements of our Bike. First we've chosen to look at a Gear Ratio Analysis, which looks mostly at gear teeth relations. Second, we've examined the Ratio of Rotations per Full Stroke and the Distance per Full Stroke, which take into account the CVT we will be using to gear the bike. Next the steering Ratio was examined. Here we look at input vs. turn angle to make sure the bike will turn properly. Lastly, we look at the drive system, measurements, and expected lengths of the drive system. We decided to use the 2.625 stem and 2.625 shaft pulley sizes, because this fit best with our design for our steering box, it also offers the ability to turn the front wheel 90 degrees, which, when coupled with the trike only driving one of the rear wheels, allows for tight turns. Here we are looking at the translation between the distance the handlebar is pushed forward and its effect on the wheel's displacement. How far will the bike travel for every stroke? The bar provides leverage in several spots changinging the displacement relationship. Ignoring the bar above the pivot, we can define this as a 4-bar crank-rocker Grashof Mechanism. The following two tables are tabulated information to use with the force calculator at the above link. Note: L1 and L2 are one continuous linkage with a revolute between the two positions. The video below demonstrates the trike's Grashof Mechanism, which has 2 toggle points when the two bars are in parallel. To get around this we will attempt to use a magnetic assist to push/pull the bars through.